Sam vs. Lupus: On being an Adjunct Professor. On being an Adjunct Professor. 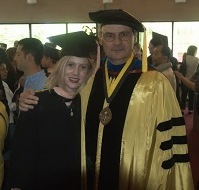 Me with my favorite (tenured) professor from Johns Hopkins. Few people who are shelling out tens of thousands of dollars for their or their children's educations realize how many classes are being taught by over-worked, under-paid part-time faculty. I am one such "adjunct professor." As described by the Washington Post, I have to run off to my full-time job after class/before class rather than stay on campus to be available for students. I don't know where buildings are, aside from the two in which I've taught, I don't know the University calendar beyond that which I need for teaching. I can't give students directions or tell them when the library is open. Simply put, I'm not on campus enough to be familiar with it. I don't even have an office in which I can keep lecture materials and meet with students, nor do I have a University phone number (and, sorry, I'm not giving my cell phone number out to a bunch of undergrads I don't know). So the only way for students to get a hold of me in an emergency is via email--not ideal. It broke my heart to have a student frantically emailing me from a hospital during a serious medical crisis because (s)he was afraid of missing points because (s)he couldn't attend class that day. Adjunct professors may be qualified (I have a PhD and two Master's degrees). But the level of qualification varies widely. But for those of us who do have the letters after our names there is little incentive to continue teaching at a job that pays little, offers no job security or benefits and adds a lot of time and stress to our week. Every semester I struggle with the decision of whether or not to invest so much time for so little compensation. So there's going to be pretty high turn-over. Remember, too, that not all of a professor's duties are limited to the classroom. I consider writing letters of recommendation for students who wish to pursue an internship or graduate school to be a part of my job. But it's something I have to do on my own time...so a fundamental part of a professor's job (helping his or her students advance in the world) becomes volunteer activity. Not everyone has the luxury of spare time; I'm lucky in that regard, and therefore so are my students. I'd like to think that I teach reasonably well despite all of these limitations, but this is not a great model for schools at any level. So if you're about to go to college or send your child to college, consider asking questions about how many courses are being taught by adjuncts, and how well those adjuncts are treated. It will make a difference to your education, and it will send a message that the "clients" of Universities care about the plight of the part-time professor. We have got to fundamentally change how professors are paid and part of the university experience. We've been trying this model and it doesn't work well for anybody--except the top levels of admin making obscene salaries. You do have lucky students--they've got a very, very qualified prof who cares about them. No one in my family has ever gone to a University, except maybe as a fluke if some event they were attending was being held on campus, so I had no idea that this was even a thing. Thank you for opening my eyes and providing me with an alternate perspective. I don't think many people outside of the University system realize that this is a thing. It's academia's dirty little secret.